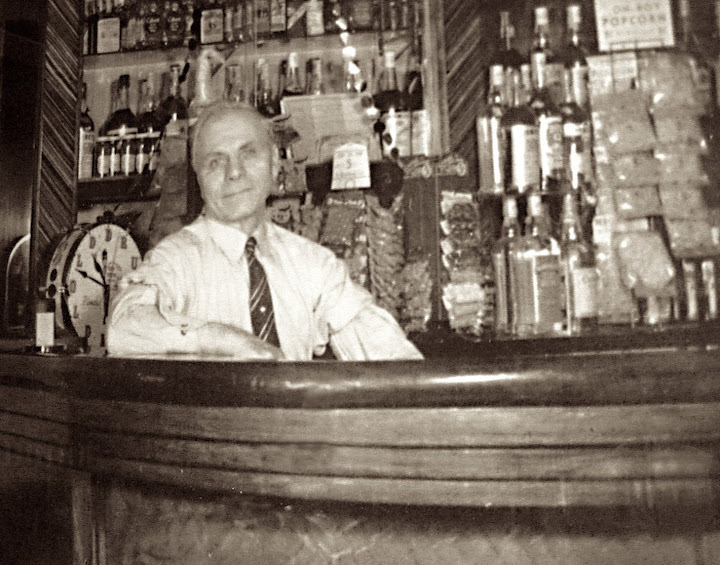 The bar we know today as Oblio's held its grand opening on this day in 1936. The Daily Northwestern contained a full page ad for the new tavern on the eve of its opening. The notice began with a message from the proprietor. John Brown personally invites you to the GRAND OPENING TOMORROW of one of Oshkosh’s finest and most beautiful taverns at 164 MAIN STREET (now 434 N. Main St). Nothing has been left undone to make this a really delightful place for discriminating men and women. The tavern’s name was John Brown's Bar. But there was no John Brown there. The name was an alias, likely used as a hedge against the lingering nativism of the era. The actual name of the proprietor was John Konstantine Kuchubas, a Greek immigrant whose picture still hangs on the wall at Oblio’s. Kuchubas was born in Greece in 1884, the same year construction was completed on the building where he installed his tavern. As a teenager, Kuchubas served in the Greek military before fleeing his homeland at the age of 18. It's not clear when he arrived in Oshkosh, but by 1915 he was here working in pool halls. 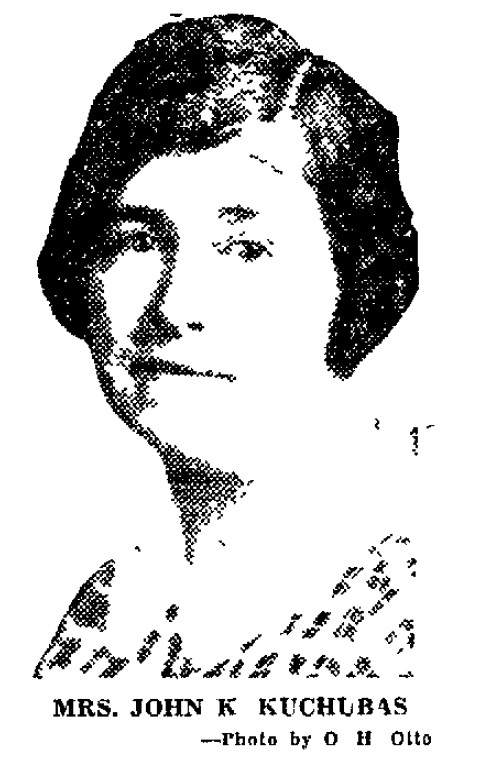 A year later, Kuchubas married Oshkosh native Elsie Zwickey. Through the dry years, Kuchubas ran a pool hall with his brother-in-law John Zwickey. 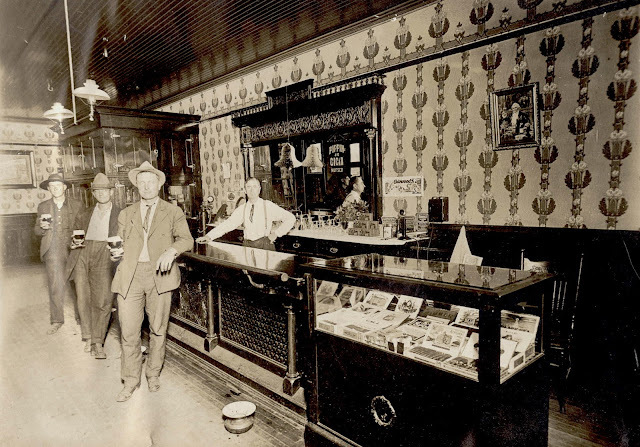 Named the Pastime Billiard Parlor, the business was located at what is now 436 N. Main, just one door north of where he would go into the tavern business. When Kuchubas launched John Brown’s Bar it became the first tavern since the late 1880s to occupy the north half of the building originally known as the Dichmann Block. The neighboring (southern) portion of the building had been home to the Schlitz Beer Hall for decades. But that establishment was outlawed with the advent of Prohibition in 1920. The division of the two, separate spaces remains clearly visible at Oblio's. The main bar room at Oblio's where Kuchubas opened John Brown's Bar. The pool halls Kuchubas ran didn't hold liquor licenses. And at 52 years old, he had no previous experience running a tavern. But that wasn’t necessarily a liability. 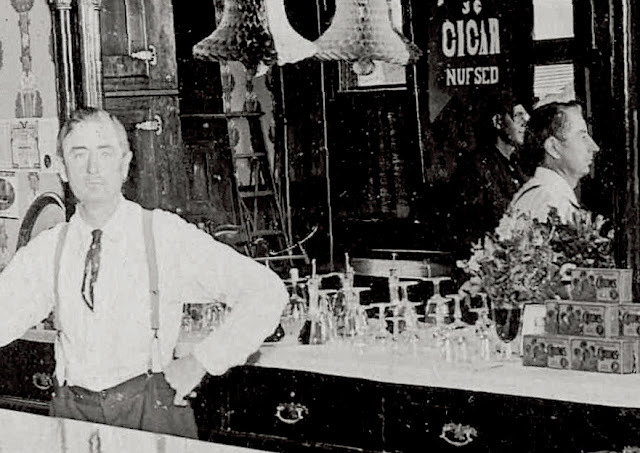 With the end of Prohibition in 1932, the rules governing taverns had been re-written. 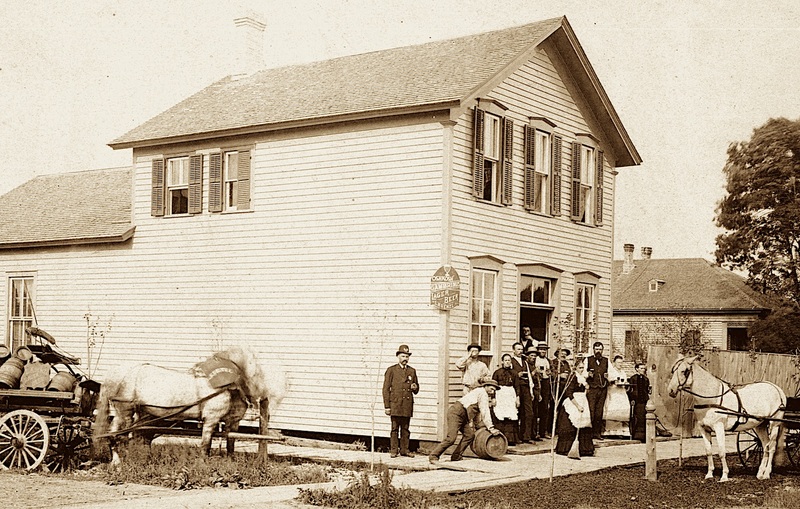 Even old-time saloonists were having to learn the business anew. Among the primary changes was the role played by brewers. 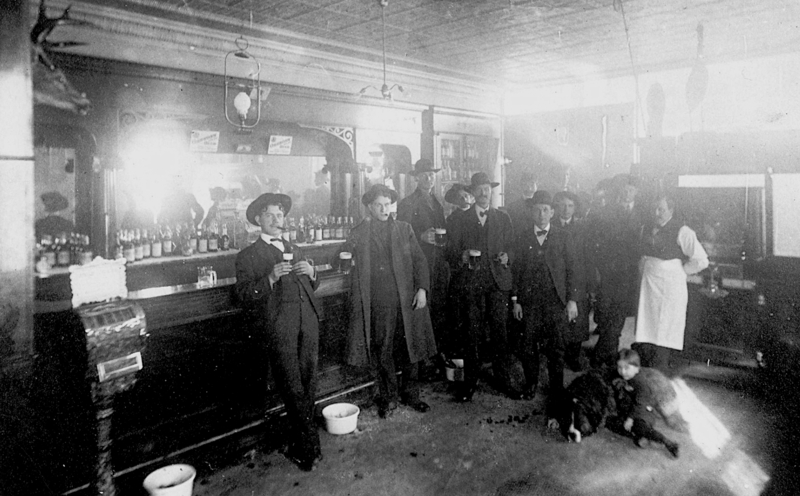 Before Prohibition, brewery ownership of saloons meant that brewers often maintained broad control over a tavern’s operation. That influence had been reduced to a minimum, due to new legislation that followed the repeal of Prohibition. It meant that for the first time, beers other than those brewed by Schlitz would be served in the building Schlitz had owned since 1886. The ties to Schlitz were no longer binding, but they hadn't been severed. Though he sold other beer in bottles, Schlitz remained the only beer Kuchubas offered on draft. 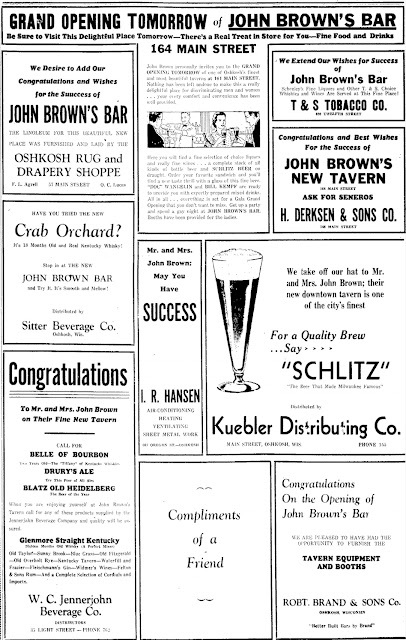 The ad for his grand opening shows the prominent position held by the Milwaukee brewery at John Brown's Bar. Kuchubas ran John Brown’s Bar until 1955 when he retired at age 71. He died 15 years later in 1970. Kuchubas is buried in Riverside Cemetery, some 5,000 miles from the place of his birth. There are two pictures of Kuchubas in Oblio's. 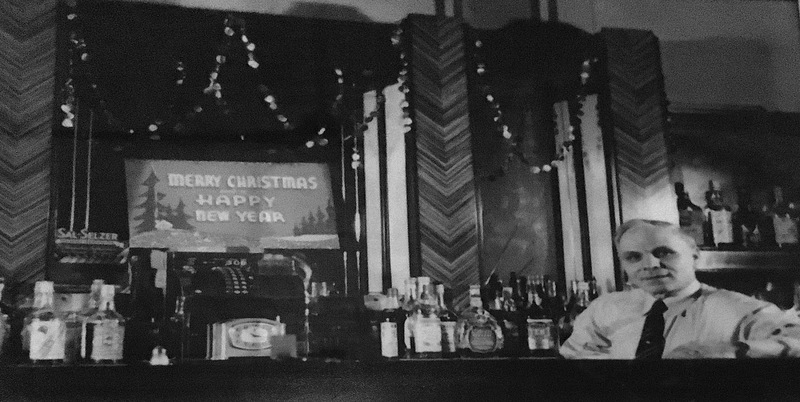 Both show him seated behind the art-deco style bar built for him by the Robert Brand & Sons Company of Oshkosh. Kuchubas imprint on the tavern waned over the years. With it went much of the bar’s original luster. The connection to Schlitz ended in 1972 when the brewery sold the building. It became Oblio's in 1974. When Mark Schultz and Todd Cummings took over Oblio's in 1979 it marked a turning point. Cummings and Schultz, who also own the building, have rehabilitated this historic bar. Their renovations included the removal of a drop ceiling to reveal the original, high ceiling of pressed tin. In 2005 they merged the separate rooms once occupied by the Schlitz Beer Hall and John Brown's Bar. Few public spaces of this vintage reveal the influence of their origin in such an immediate and approachable way. Oblio's is one of those rare places. It's all still there, right down to the Schlitz. 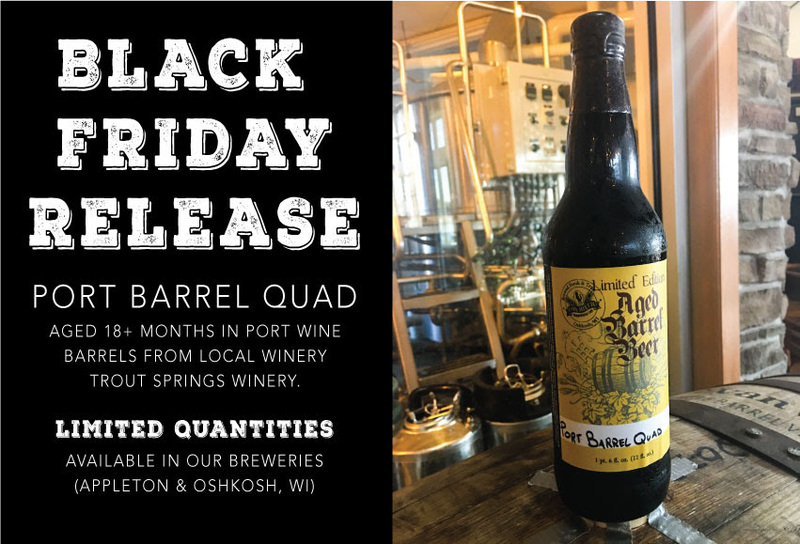 Earlier in the week, I blogged about the Black Friday beers that’ll be released in Oshkosh today. I should have also mentioned that Black Friday and beer go back a long way in Oshkosh. 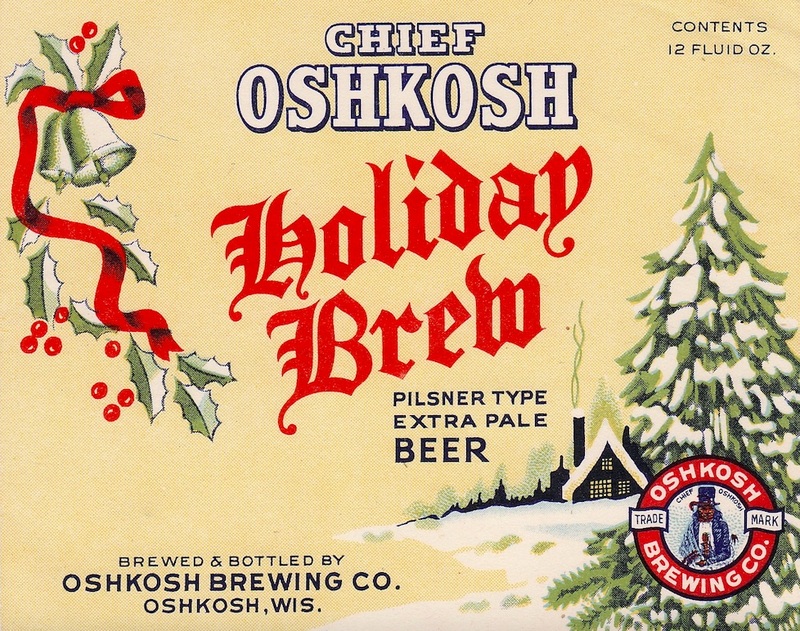 The Friday after Thanksgiving was the day when Oshkosh’s breweries would release their annual batches of holiday beer. These were strong lagers sold at the standard price as a customer appreciation gesture. Here’s an ad from the Daily Northwestern published on Black Friday, November 25, 1955. HOLIDAY BREW IS IN! Imagine that, $2.35 for a case of limited release beer. A steal! That monochrome ad barely hints at the excitement generated by these beers. People in Oshkosh flocked to them. The supply often ran out before the end of the season. It was considered a special time for beer lovers here. The labels certainly conveyed a sense of cheer. 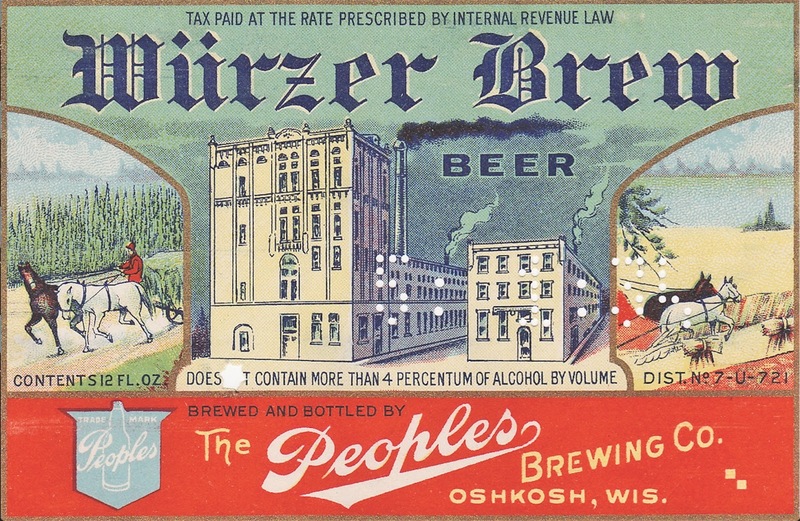 Of course, all this was swept away in 1971 and 1972 when Oshkosh Brewing and Peoples Brewing closed. Nobody then could have imagined the revival we're now experiencing. If you’re out today at Bare Bones or Fox River indulging in their Black Friday beers take a moment to consider where we stand. Our beer culture, left for dead, is vital once again. Today is a good day to make the most of it. Both Oshkosh breweries are releasing small-batch, barrel-aged beers on Black Friday, November 25. Here's what’s in the offing. The taproom opens at noon when they’ll get into a keg of Feed the Dog Scotch ale aged in a Vanguard Whiskey barrel from Great Northern Distilling. I had a preview taste of this one. It’s very good. The beer, with its notes of sweet caramel and light roast, melds nicely with the caramel and vanilla tones drawn from the barrel. It’s quite strong (over 9% ABV), but quite drinkable. They're releasing just a quarter-barrel of this one, so Black Friday will likely be the only crack you’ll get at it. November 1936. Prohibition has been consigned to the past. Beer has been legal for three years. The trip to the beer depot seems normal again. People in Oshkosh are getting ready for the Thanksgiving feast. They’re stocking up on beer. 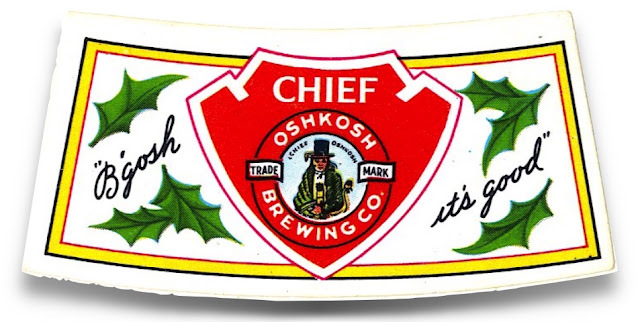 Most of what they buy is brewed locally: Chief Oshkosh, Peoples Beer, Rahr's Elk's Head. 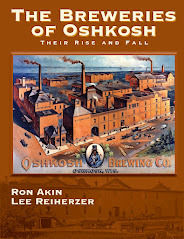 The Oshkosh Brewing Company places an add in the Northwestern trying to sway people towards their brew. 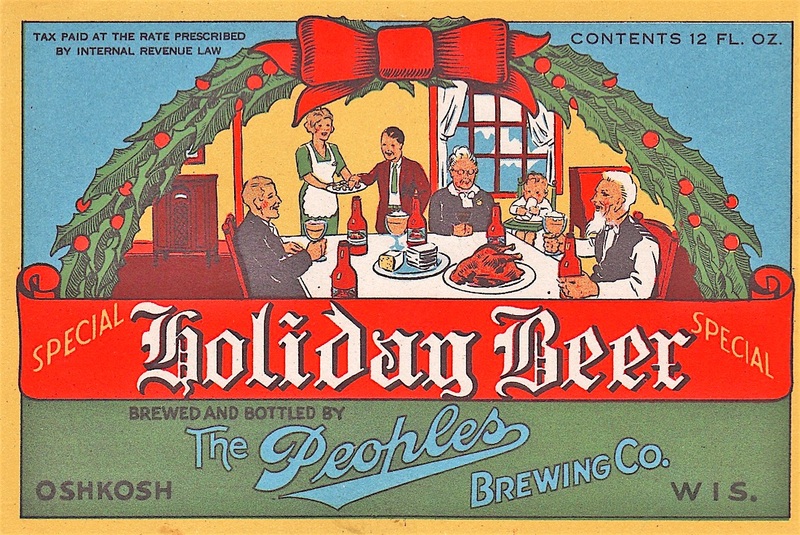 This fine beer makes good food taste even better… It blends… A whole day of enjoyment… the thoughtful hosts way of saying “Good Cheer.” I love that! Let’s jump ahead to 1955. Otto’s at 16th and Oregon is offering Thanksgiving specials on beer from all three Oshkosh breweries. 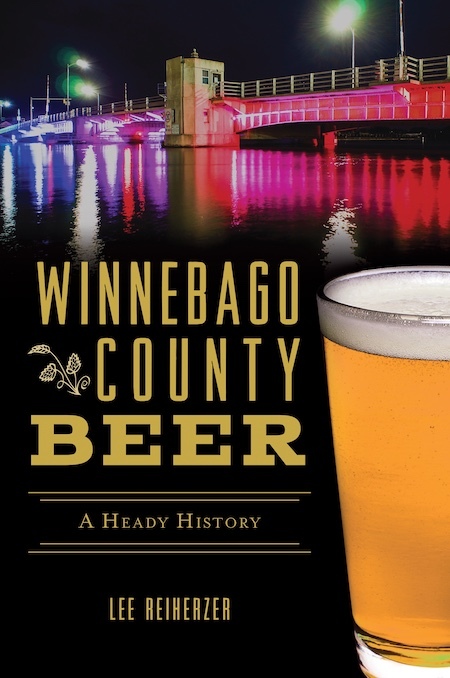 The local-beer tradition gradually faded. 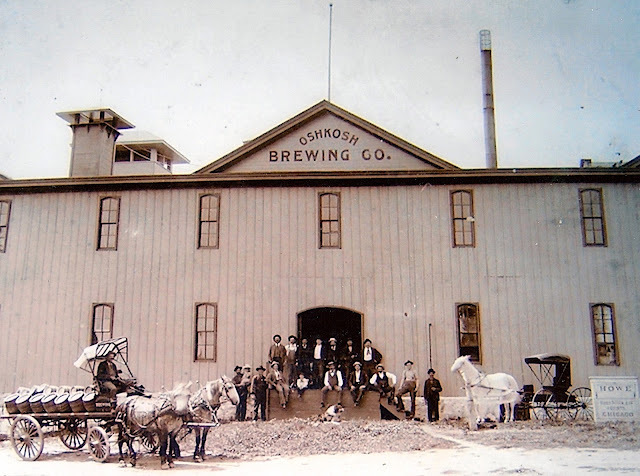 It was extinguished in 1972 when the last of Oshkosh’s breweries failed. Now it's returning. When I was carrying them into the house, it dawned on me that I’d never done this before. I had never gone out to buy beer for Thanksgiving and come home with 6-packs of Oshkosh-brewed beer. It felt good doing that. 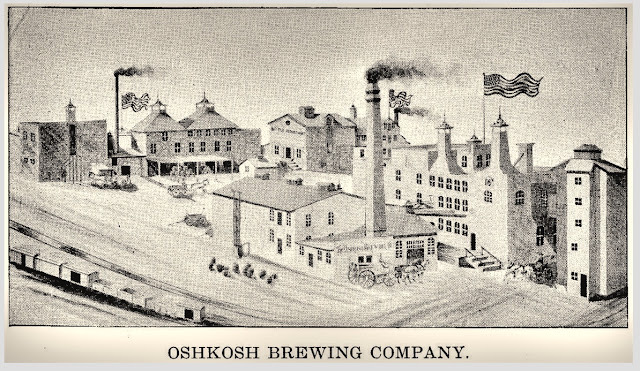 I write all this stuff about Oshkosh beer history, but I’m observing it from a point off in the distance. It can be somewhat alienating. Walking into the house with those sixers the other day was the exact opposite of that. There was no separation. I was doing something that was once common here. I was bringing home Oshkosh beer for the holiday. That used to be a thing taken for granted. It shouldn’t be. Like the ad says, that’s something to really be thankful for. 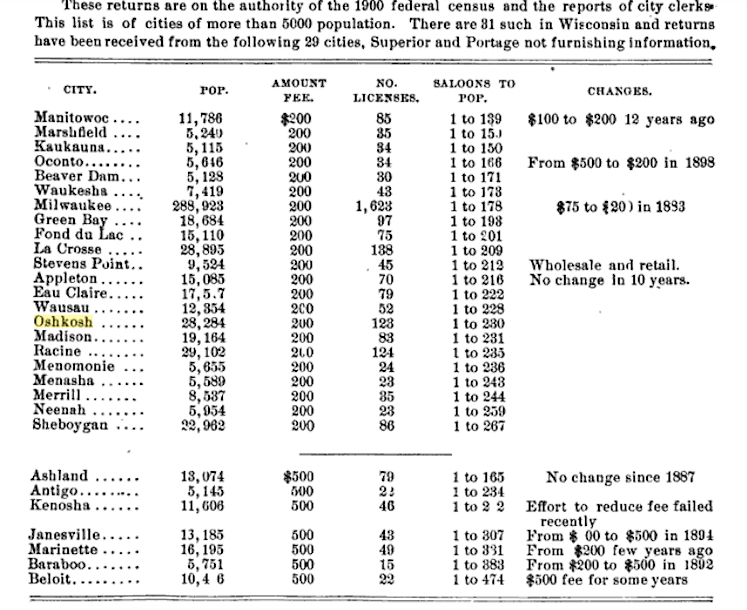 In the year 1900, Oshkosh’s population was 28,294. Those Oshkoshers were kept lubricated by 123 saloons. That’s one watering hole for every 230 souls. Sounds like a lot of saloons for a city that size. It wasn’t. The ratio was right on par with that of other Wisconsin cities (more about that at the bottom of the post). But numbers add up to nothing without a visceral sense of what they represent. And that's the point of today's post. Here we have a few photos that give a glimpse into our city’s early and infamous saloon culture. The photos you see here can be enlarged by clicking on them. I want to start with my favorite picture of this bunch. 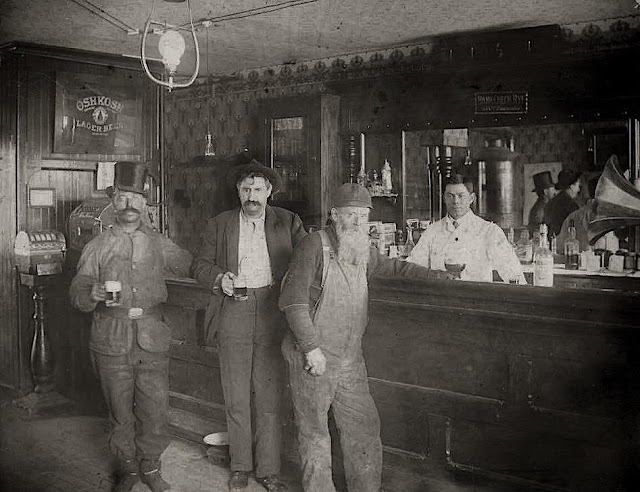 This was taken in the early 1900s at a saloon built and owned by the Oshkosh Brewing Company. It was operated by “Happy” John Wawrzinski. You’ll see him at the extreme right wearing a white apron. Notice the dark beer and the spittoons. We’ll see plenty of each on this tour. Happy John’s was located at what is now the southwest corner of Oshkosh Ave. and N. Sawyer St. (think kitty corner from Repp’s). Unfortunately, the building no longer stands. Next we head downtown. This shows the interior of Tom Ryan’s Clipper Club. This was a “sporting man’s” joint. Check out the pictures of race horses on the walls. That picture may seem familiar. They have a copy of it hanging on the wall in Oblio’s. Tom Ryan’s place was just a couple blocks south of what is now Oblio’s. Ryan's was located on the east side of Main St. between Waugoo and Washington. If you want to dig deeper, there’s more on Ryan and his saloon here. Next we’re off to the heart of the old Bloody Sixth Ward. We’re going to the northeast corner of Knapp and W. 6th streets. This is another saloon tied to the Oshkosh Brewing Company. We’re looking into the saloon operated by Joseph Koeck, seen behind the bar. This photo was taken about 1910. Notice at the right edge of the picture you can see the horn of a gramophone. I’d love to hear what was coming out of that. Happily, Koeck’s old place still stands. It's now The Uptown. And you can still get a beer there. We now stumble into the realm of the unknown. Maybe someone can enlighten me on this one. Believe me, I’d appreciate the help. I’m guessing this place may have been the saloon operated by Eber Simpson and Joseph Koplitz on N. Main St. Their bar was located on the east side of the street two doors north of the corner of Main and Otter. Quit drooling over all that dark, foamy beer for a moment. Take a look at the man behind the bar. Here’s a better view of him. 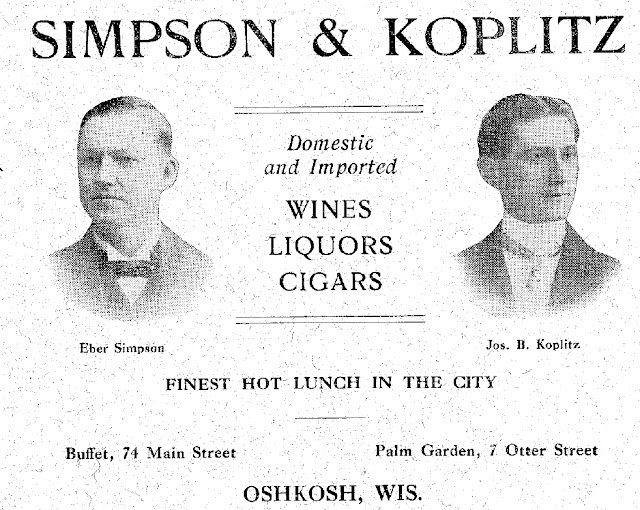 Do you think he resembles the Joseph Koplitz shown in this ad from 1908? I see a similarity, but I can't confirm he's our man. I'll see if I can turn up more. I know where this next place is. We’re in the middle of the Highholder community. This is an undated photo of Joseph J. Nigl’s Gemütlichkeit Saloon. It stood at the northwest corner of 9th and Ohio. The building remains and it's still home to a bar. Today you know it as Ohio Street Station. I think that's Joseph Nigl in the back row on the left with the mug of dark beer held high. There’s more on the old Nigl stand here. What's not to love? A cop with a stogy... A dude rolling in another barrel of beer... 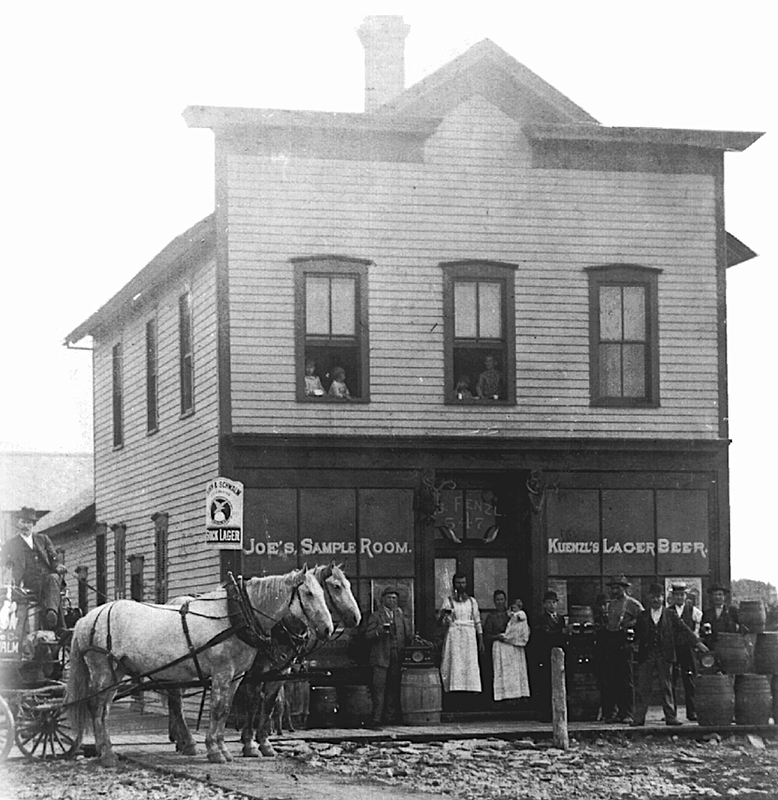 The shield on the corner of the saloon reads “Oshkosh Gambrinus Lager Beer L. Kuenzl.” The man standing in the doorway with the beer raised to his mouth looks very much like Lorenz Kuenzl of the Gambrinus Brewery. I suspect it’s him. This is the only picture I have from the pre-prohibition era showing women with beer in their hands. Look to the right side. The woman in the white frock has three beers, two on a tray, one in her hand. The woman next to her in the dark dress has a foam-topped dark beer in her left hand. Wonderful! On more. This is a picture you may have already seen if you ever been to Jeff’s on Rugby. That’s because this is now the home of Jeff’s on Rugby. 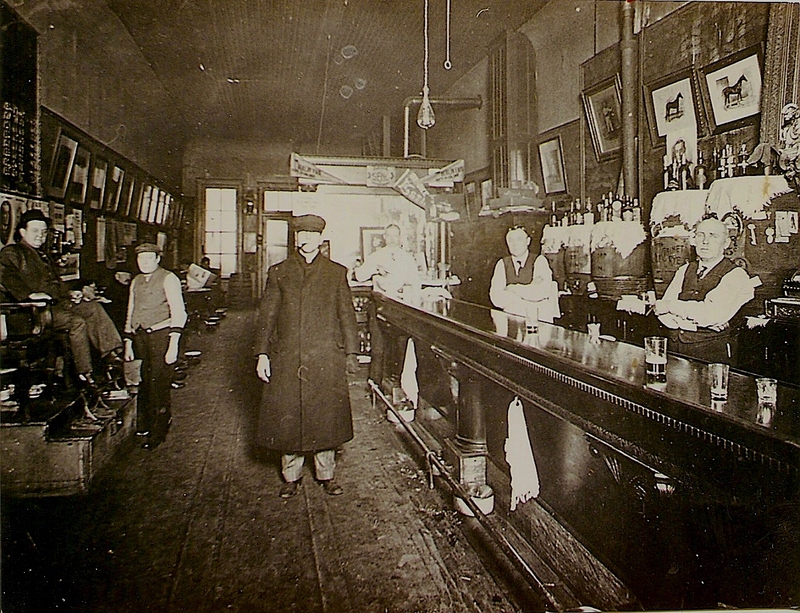 It was Josef Fenzl’s saloon back when this picture was taken in the early 1890s. That’s a delivery team for Horn and Schwalm’s Brooklyn Brewery coming into the picture. As usual, there’s dark beer galore. Not to end on a down note, but I think it’s worth mentioning that every lively, happy, beer-drinking person in these photo’s is now dead. When their time came, I’ll bet the moments captured here were not regretted. This is the stuff that makes life worth living. Finally, I mentioned earlier that Oshkosh was pretty much in-line with other Wisconsin cities when it came to saloons. Here’s proof of that. This is a chart from 1900 showing per-capita saloon ratios for Wisconsin cities with populations of 5,000 or more. And the winner is…. Manitowoc! The Municipality, Published by League of Wisconsin Municipalities, 1901. If you like this stuff, a couple more Oshkosh saloons photos from the era can be seen here. And the post-Prohibition companion to this post is available here. Prost! I want to expand on something I mentioned in last Monday’s post that involved this picture. 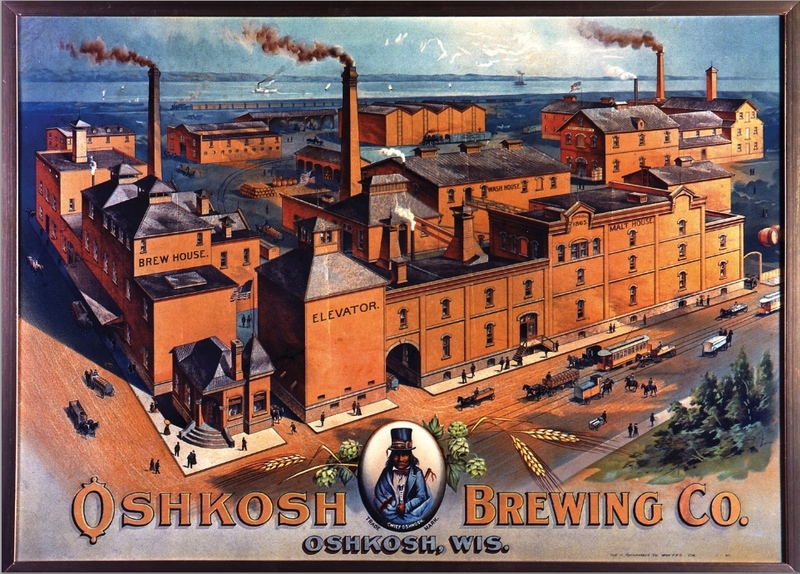 That’s a lithograph produced for the Oshkosh Brewing Company at the turn of the century. But as I said last week, the brewery looked nothing like this. This print shows an amalgamation of OBC’s three separate brewing facilities. Each was located in a different part of town. Let’s break this down. 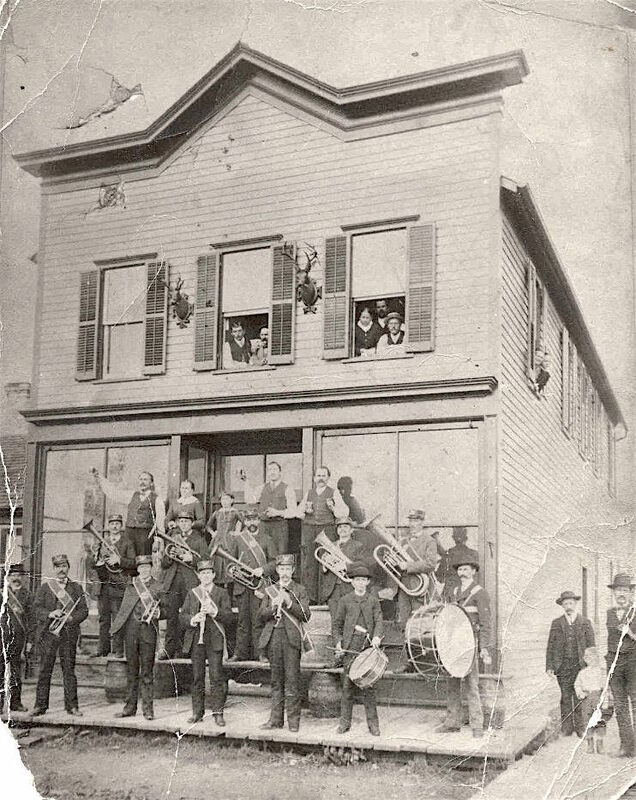 First, here’s the piece of the picture that represents the OBC facility located at what is now 1235-1239 Harney Ave. Prior to the formation of OBC in 1893, this was Lorenz Kuenzl’s Gambrinus Brewery. It’s difficult to see, but the sign on the building with the flag flying over it says “Bottling Dept.” At this point OBC was bottling its beer here. That building had been used as an ice house when the Gambrinus Brewery was in operation. As you’ll see, the artist took a few liberties with the subject. Here’s the real thing. Now we head to the south side of town. They used to have a pet name for it: Brooklyn. I wish that were still an Oshkosh colloquialism. Anyway, at the end of Doty Street, in what is now the 2400 block, stood one of OBC's two brewhouses. This was formerly John Glatz and Son’s Union Brewery. And here’s what that piece of OBC actually looked like. 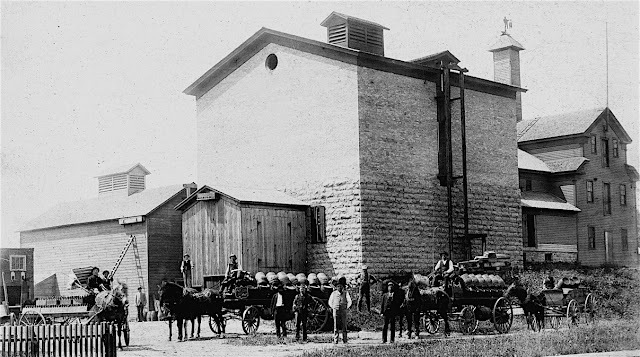 Just up the road from the old Glatz Brewery was OBC’s other brewhouse. 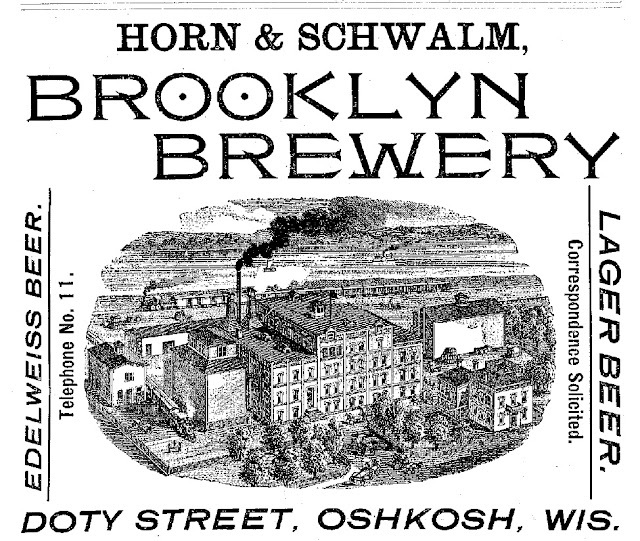 This was once known as Horn and Schwalm’s Brooklyn Brewery. 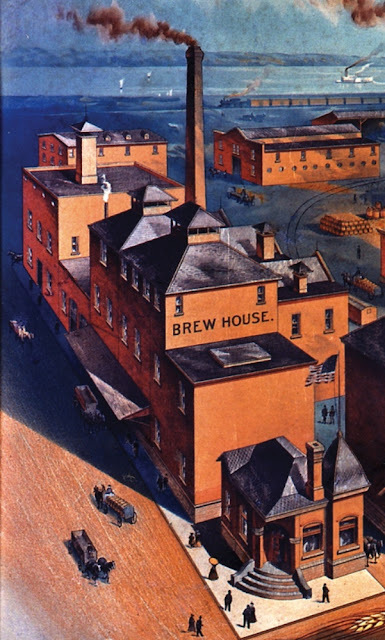 Here’s the part of the lithograph showing that brewery. 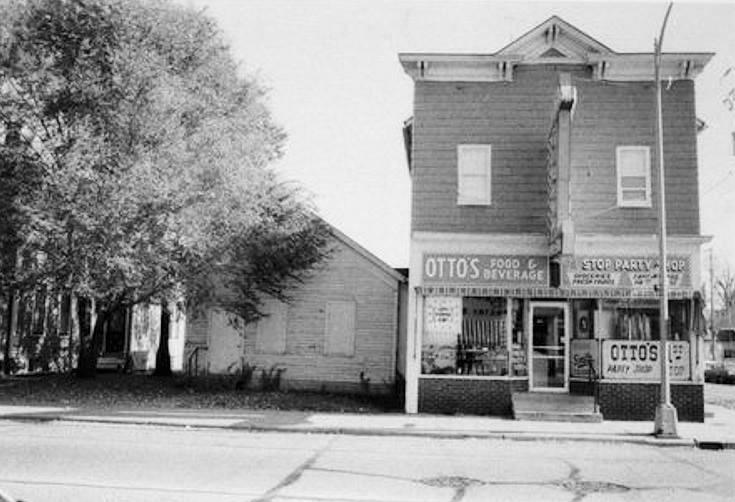 It was located in what is now the 1600 block of Doty Street. 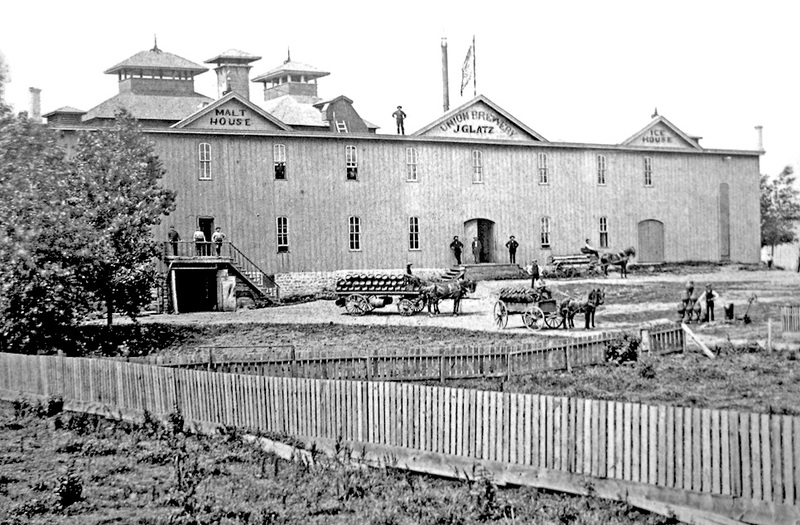 Notice that it has “Established 1865” on the gable atop the malt house. That’s one of the few times OBC got its starting date right. That’s the date when Leonhardt Schwalm launched the Brooklyn Brewery, the oldest of the three breweries that merged to form OBC. 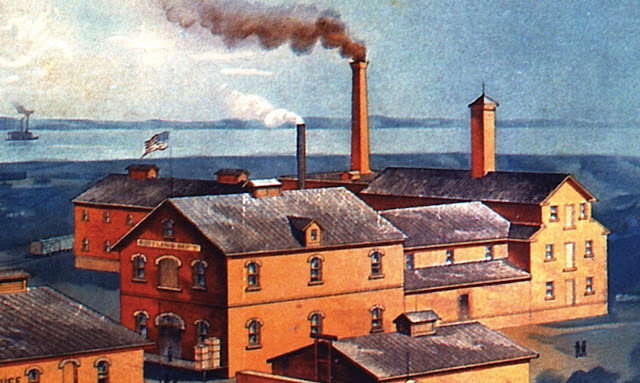 Here’s what the old Brooklyn Brewery really looked like. 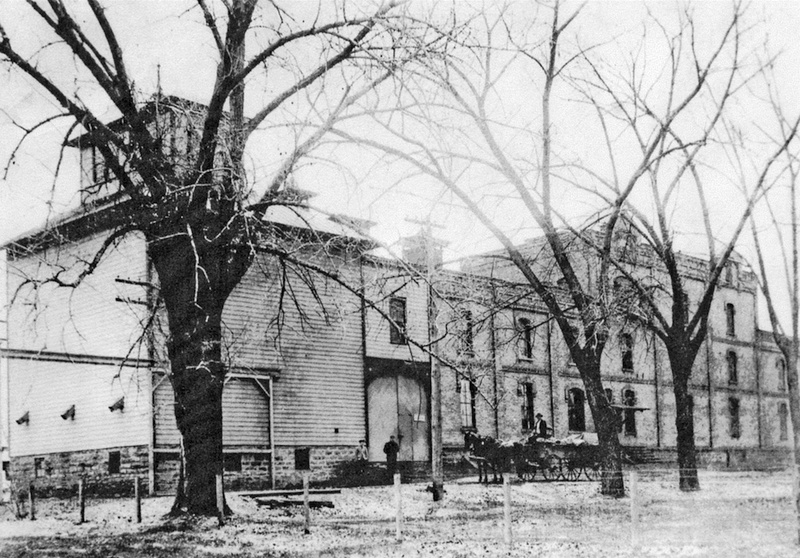 Part of that brewery still stands. It’s the only piece of this picture that remains. This is what it looks like today. The color lithograph wasn’t the first stab OBC took at painting itself larger than life. 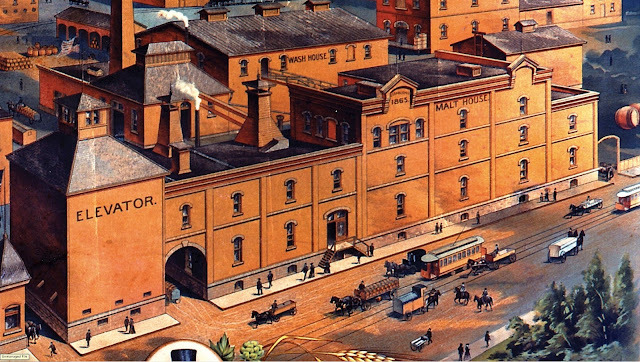 Here’s a drawing of the brewery from 1898. This one is even more delusional. OBC certainly wasn’t unique in doing this sort of thing. At a time when photography was less common, brewery images were most often rendered by hand. And more often than not the artists aggrandized their subject. Here’s another example. 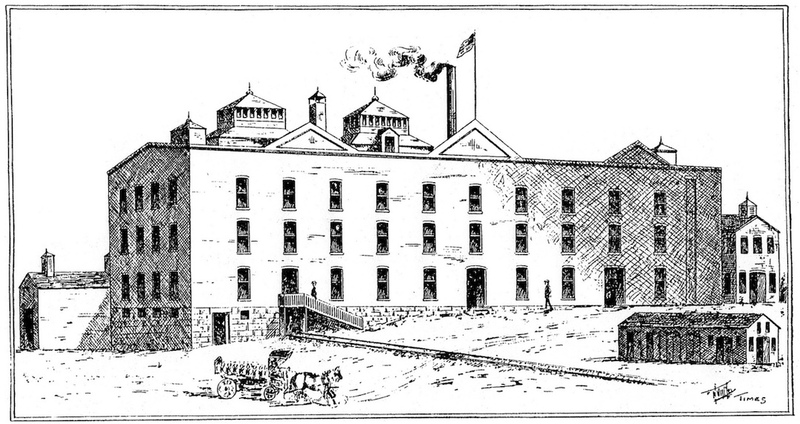 This is a late-1800s drawing of the Glatz Brewery. The artist added a third floor to it. 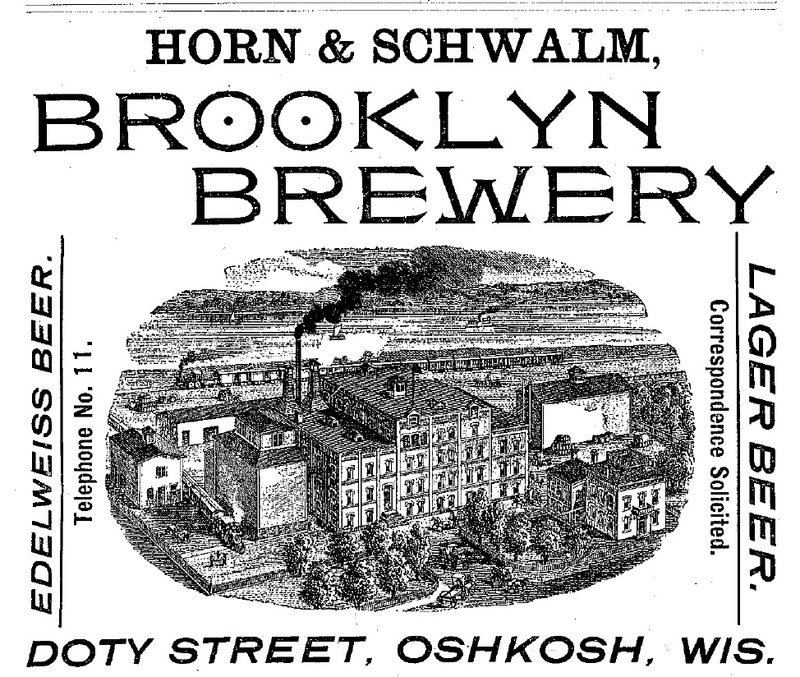 And here’s an 1891 ad with a drawing of the Brooklyn Brewery. Again, an extra floor was added. 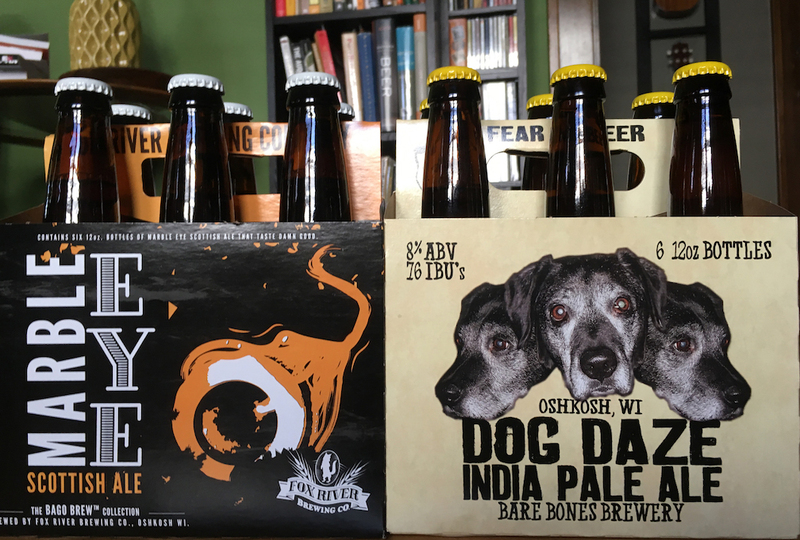 Fox River Brewing Company will have a beer and jerky tasting in the brewery’s Oshkosh taproom from 4pm until closing. Four different flavors of Jack Link's beef jerky will be paired with 10oz. Pours of Fox River beer. $15 per person or $10 for Mug Club Members. More info here. 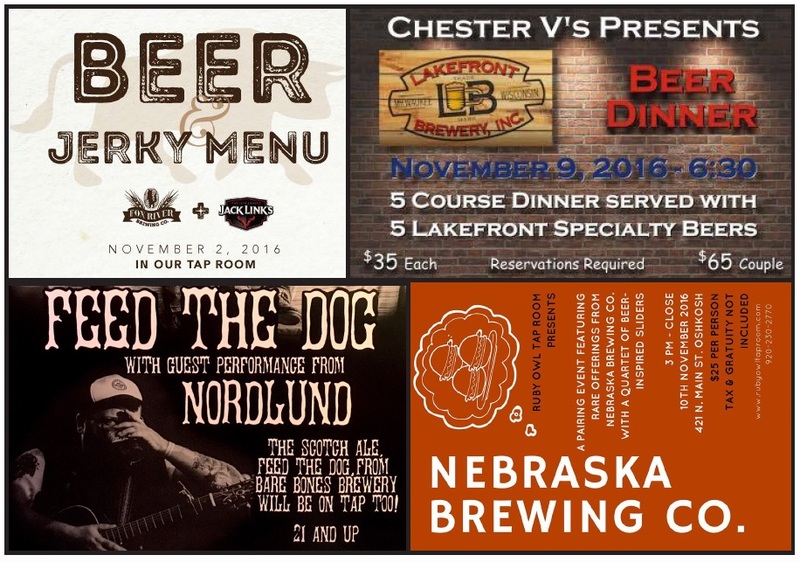 Chester V’s presents a 5-course dinner served with 5 specialty beers from Lakefront Brewing. Tickets are $35 per person or $65 per couple. Reservations are required. More info here. Scheduled opening of the area’s newest brewpub, Dairyland Brew Pub in Appleton. More on Dairyland here. Nebraska Brewing Company tap takeover and slider pairing at the Ruby Owl Tap Room. Four NebBrewCo beers will be paired with sliders inspired by the beers. Offer begins at 3 pm and will run for most of the evening. No reservation necessary. $25 per person. More info here. Feed the Dog at Ruby Owl beginning at 8 pm. The band Feed the Dog plays while Bare Bones Brewery’s Feed the Dog Scotch Ale pours. Guest performance by Bare Bones Brewmaster RJ Nordlund. More here. The Roxy is hosting a Beer vs. Wine dinner. Each course of the five-course meal will be paired with a beer and a wine. You decide which is best. Dinner begins at 6:30 pm. $45 per person. Sign up at The Roxy bar or call (920) 231-1980.